Walking Tour | F.O.C.R. Inc. Walking Tour – F.O.C.R. 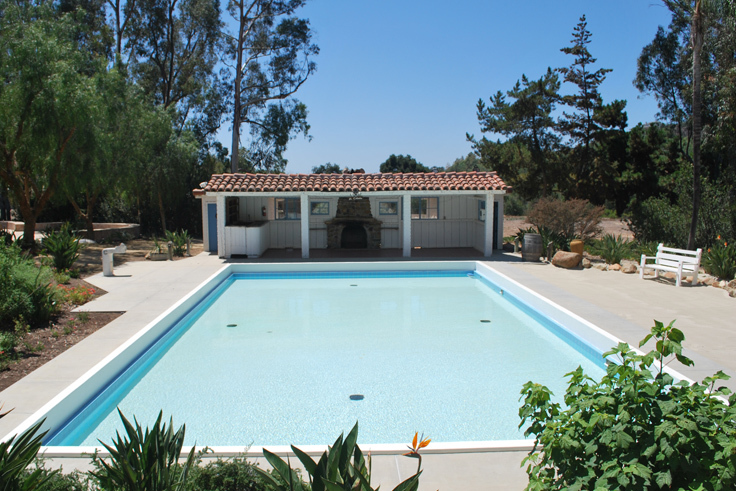 Inc.
Carrillo Ranch is a large Park (27 acres). Distances from the parking lot to the Visitors Center or to the Hacienda and points in between are quite lengthy. Those whose strength is impaired by age or disability may find touring the site overtaxing. Come prepared. Dress sensibly. The terrain is uneven in certain areas. Sturdy shoes and appropriate clothing are musts. Some may wish to carry bottled water if the weather is hot and/or muggy. Some slopes are steep. Pathways have been dressed with decomposed granite and can be slippery. Especially avoid the roadway between the parking lot and the Caretaker’s Cottage. Use the paved ADA ramp as a safer alternative. Historic buildings may be closed — unless you are with a group that has made advance docent arrangements or you are taking a scheduled weekend tour. Closure is to protect the interiors and their artifacts. However, there is plenty to see from outside the buildings and elsewhere in the Park. Come anyway and enjoy. Inclement weather is a factor. The pathways can become impassable when wet. Don’t be disappointed. Call ahead (760.476.1042) for information. Touch and remove nothing. Everything you see is public property. Please leave it behind for the next visitor in the same condition you found it. Thank you. From the parking lot go to the west end of the white fence along the north rim. Make an immediate right turn onto the paved, gently sloped ADA Switch back ramp. Descend to the valley floor. At the bottom take another right, cross over the Old North Bridge and observe the weir complex to the east. Note that the original wooden structure is concealed by a concrete cap to accommodate emergency vehicles. This is all that remains of the historic entry route used by family and guests who exited off Palomar Airport Road. 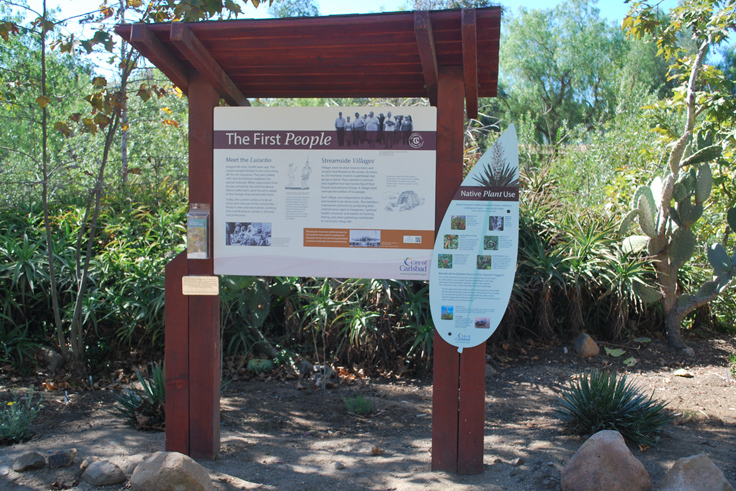 Reverse direction and proceed to the First People and Native Plants Interpretive Sign. Here, you will find a botanical walking tour guide. Numbered posts corresponding with some of the Ranch’s significant plants follow as you walk down Palm Lane. Proceed to the Caretaker’s Cottage, which features staff offices and exhibits. 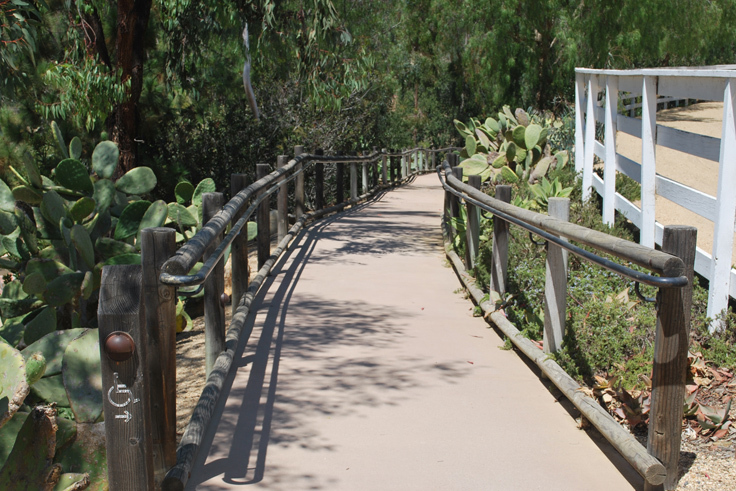 Be sure to pick up a copy of the City of Carlsbad’s free Ranch guide that is packed with historical information and makes a great souvenir. Amble down Palm Lane enroute to the Hacienda compound… ideal for strolling, reflection (and exercise). 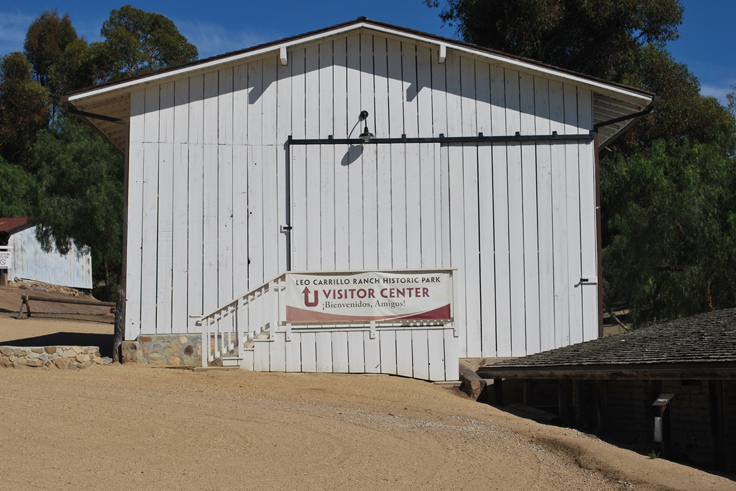 Be sure to note the rare Toyon Trees around you and the Water Storage Tank atop the hill to the left. As the central plaza/concourse opens up before you, the magnificent Hacienda Compound beckons on the right. Enter through the center portal with its unique ornamental gate. Take your time visiting the main house, the attached bedrooms and courtyard. Now depart through the east porch archway leading to a secluded side garden. 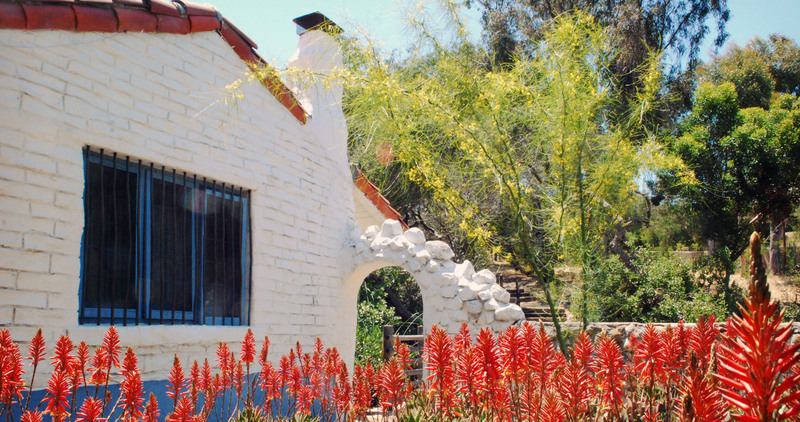 Behold the carefully restored Patio — and the as yet unrestored Wash House. 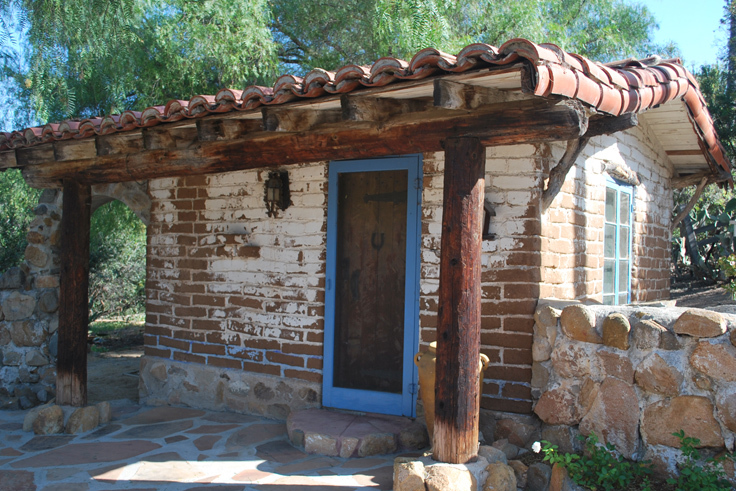 Leo lived in this tiny building for many months while the rest of the rancho was being constructed. Look for the gate at the left-hand corner and pass through. Watch your footing! View the spectacular Barbecue, Pool, Sand Beach and Cabana. Ah, sorry, no swimming allowed. Note the towering Windmill that faithfully served the pool’s needs. Alas, no more. 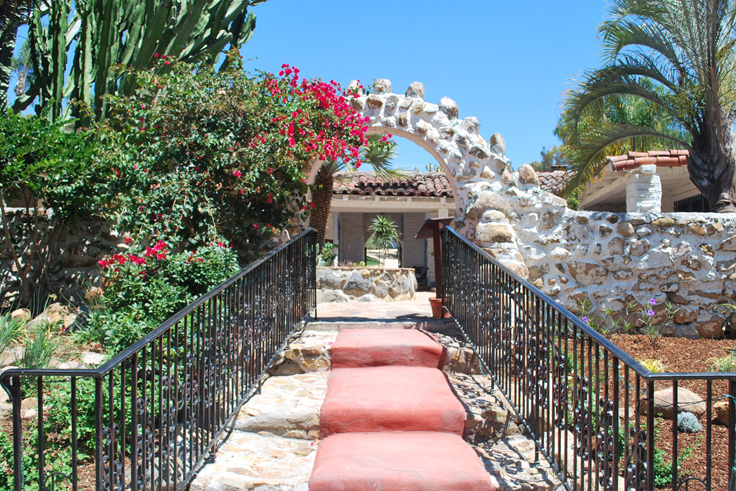 Return to the hacienda courtyard through the striking Bride’s Arch (a favorite spot for picture-taking). 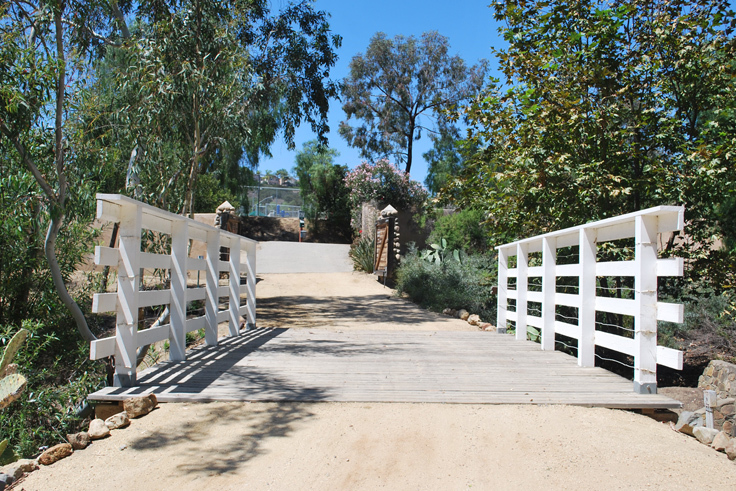 Now turn right, cross the bridge and contemplate the steep trail that leads to one of the Park’s most popular features. Are you up to it? Welcome to the celebrated Deedie’s House, the private retreat of Leo’s wife, Edith. Here she pursued her hobby as a handicrafter and collector of Native American pottery. 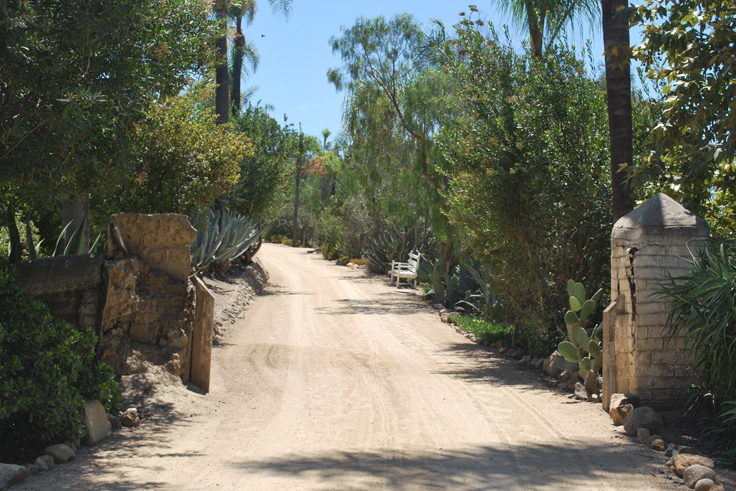 Take the time to enjoy this secret place and then descend to the hacienda courtyard via the same steep trail. Be careful. Exit through the central portal to the plaza/concourse’s open vista. 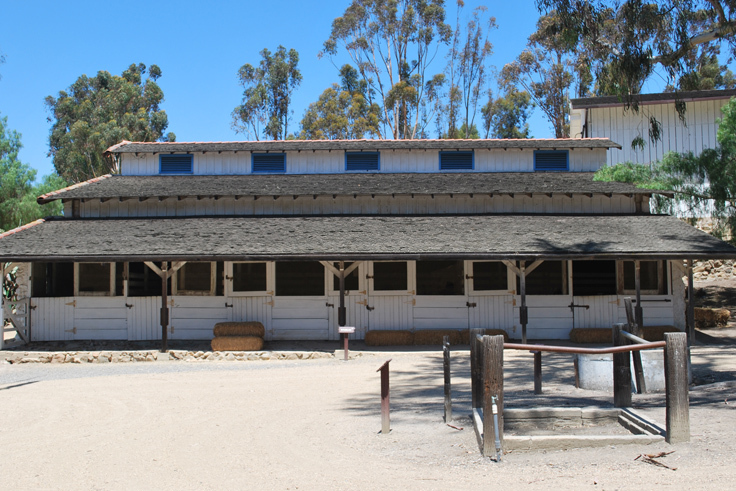 On your right (in this order) can be seen the Cantina, Carriage House (sometimes used as a classroom during student field trips) and the Tack/Feed Shed. Another windmill lies just ahead. 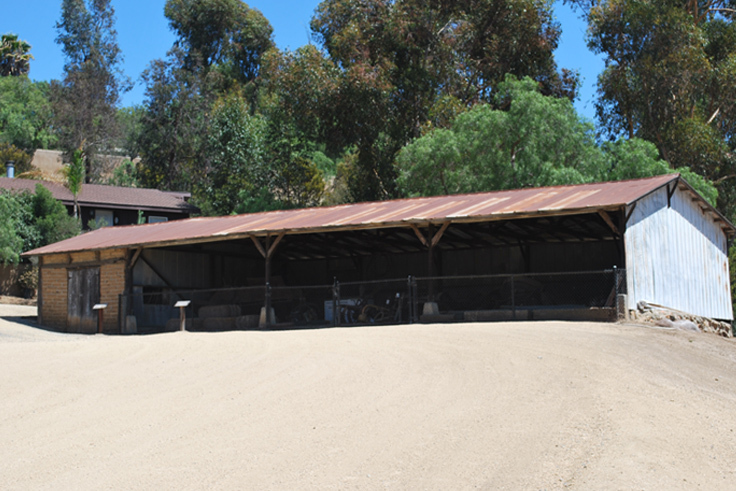 Approach the Stable with its stalls, mid-level storage area and upper level Bunkhouse. Access may be temporarily restricted since restoration is incomplete and the interior surfaces may be hazardous. As your circuitous path reaches the structure’s upper level the next important stop is before you. The Old Hay Barn was restored and reopened to the public in 2011. Recipient of a 2012 Governor’s Award for Historic Preservation, the hay barn now serves as the visitor center and the home to the Kindle Theater. 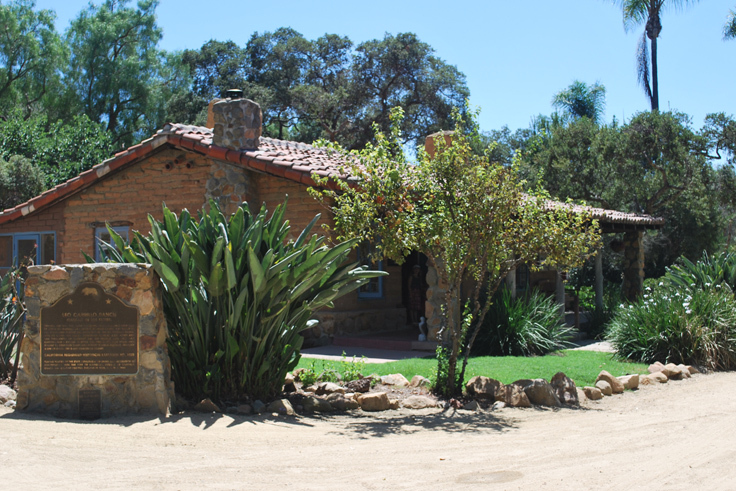 A state-of the-art 13-minute video presentation on the history of Leo Carrillo Ranch is available for showing and should not be missed. Upslope, visit the Equipment Shed and Foundry/Blacksmith Shop. Modern caretaker’s quarters can be seen in the background. Head in the direction of the parking lot but don’t miss a few other points of interest along the way. 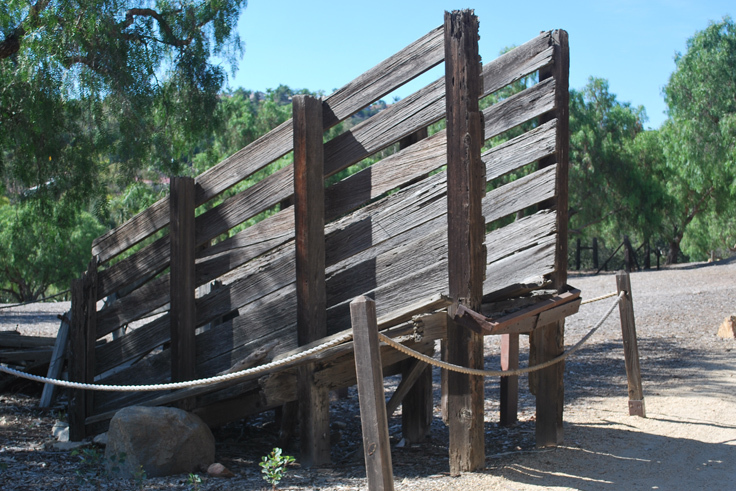 You will pass a classic Cattle Loading Chute (also due for restoration) on your left. 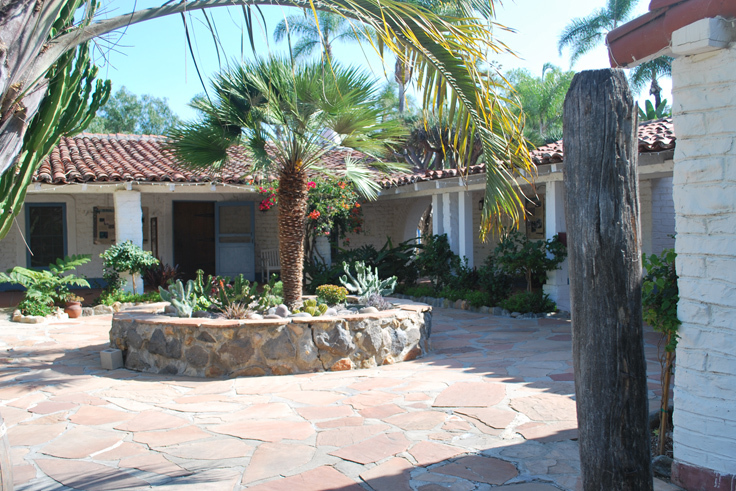 After all, the Los Kiotes was a working rancho for many years. Note the orange orchard to the left which is also a restoration project underway. 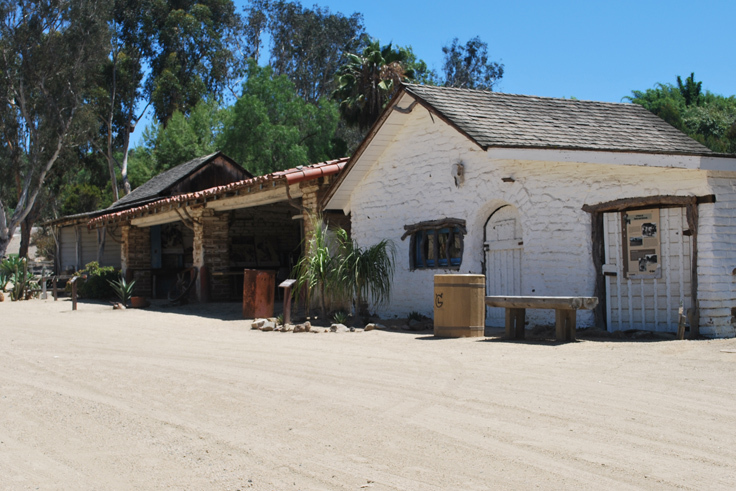 In its day Carrillo Ranch was a large grower and marketer of citrus fruit. The next treat in the distance to your left: Big Red, once used to harvest the rancho’s bounteous lima bean crop. Big Red is in good working order but it is no longer in demand. This is its final resting place. 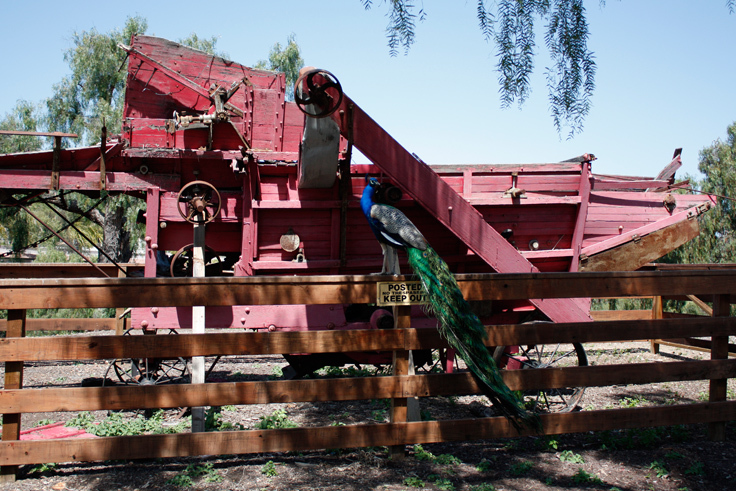 The peafowl are feral and are able to migrate freely throughout Carrillo Ranch and the greater Rancho Carrillo community. The City of Carlsbad does not own or keep the peafowl; rather, we share the park with them. 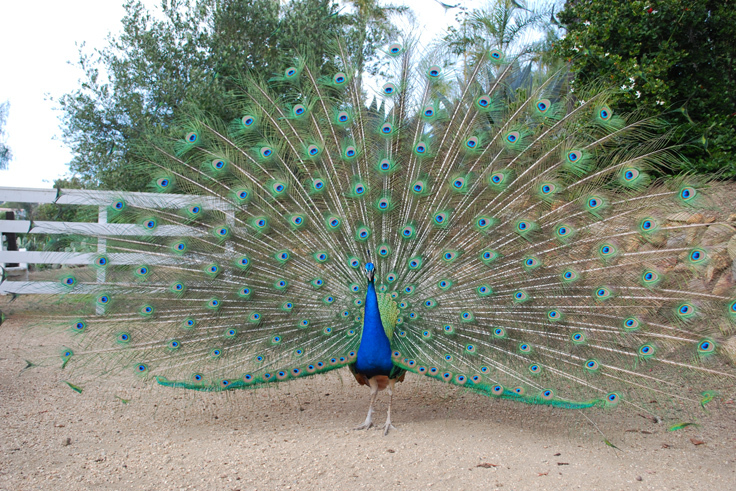 Peafowl have long been enjoyed as an ornamental bird. Some Ranch visitors come just to see the beautiful peafowl, not for the rich history or beautifully landscaped grounds. 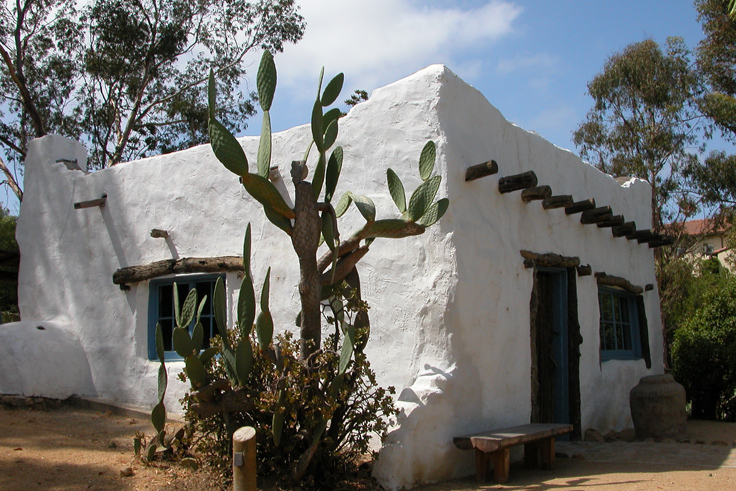 And from his writings, Leo Carrillo would have liked that! The peafowl are accustomed to people, but are not pets. Please do not, touch, chase, or harass them. Thank you for not feeding the peafowl. Your tour is now ended. Congratulations… and please come back again.